The Sloughi was developed in North Africa. This breed was used as a desert hunter for the fox and other animals. This breed of dog became very popular and was treated as a member of the family by the Africans. 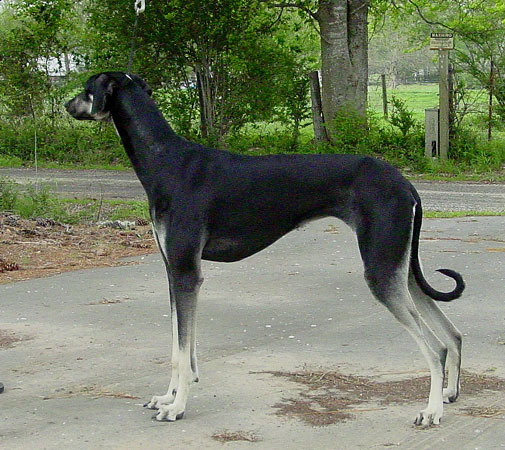 These days this breed is considered rare and it is difficult to find such breeds in other places. The Sloughi is tall and eager they posses a very gentle and noble appearance they are very energetic and athletic. They are capable of jumping and running fast. This breed of dog is intelligent, active and alert. The Sloughi is a very loyal and dependable breed, they are very attached to their owners, moreover, they don't like to change their given family. This breed of dog is brave and energetic and can be used as a watchdog they are very effective when they have a job to do, they can protect and guard their family and alert them. This breed of dog is suspicious with strangers and is not easily get along with stranger. This breed of dog does well with children and older and can be good with other small pets, if they are properly socialized. They have a strong and emotional attachment with their family and will become destructive if left alone for long periods. They have single coat which is smooth, dense and soft and lies close to the body. This breed is an average shedder. The Sloughi is a good learner and should be trained properly, they will not respond to any hard and harsh methods of training, the training should be given to them with fairness and patience. This breed of dog needs regular exercise, they love to go out for a jogging and enjoy the family play sessions. They will do ok in apartments. This breed of dogs needs regular bushing and bathing should only be given with a dry shampoo, they don't do well in cold climates. This dog breed is prone to progressive retinal atrophy and hemophilia.